Clean the concrete well, and allow to dry. 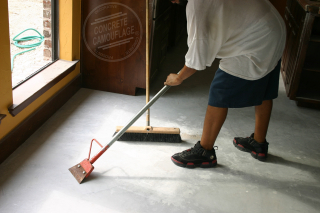 When staining concrete, cleaning and preparing the concrete is one of the most important steps. If the concrete hasn't been adequately cleaned and prepared, then inferior results can and will ensue. Looking at concrete under a microscope you see that it looks like a sponge. Though it appears to be a smooth surface to the eye, it is actually very porous. The need to clean the surface is obvious and fairly easy, it's what stays trapped in the pores that will work against you. This is the piece of the puzzle that makes the difference. 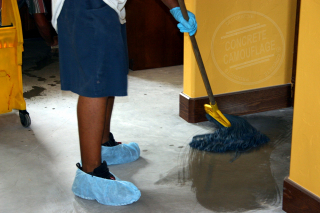 First, before doing your final clean, ensure the concrete is free from all contaminants. Strip any curing agents or waxes, remove any paints or glues, ensure there is no grease or oils. Because many oils and petroleum based contaminants can be hard to see until after the stain is applied, we recommend that you first scrub the area with a concrete degreaser. 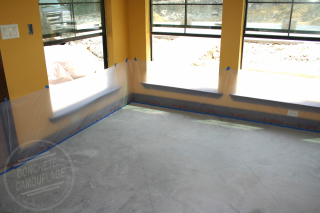 Our Concrete Stain Prep and our Wax Remover are both excellent concrete degreasers. For Final Cleaning, you should do a good scrub down using T.S.P. (trisodium phosphate) and water. Use a stiff straw scrub brush or a floor buffing machine with the aggressive scrubbing pads. Mop or rinse a couple of times with clean water. Note: Many states no longer allow phosphates. But that's ok because our T.S.P. phosphate free works just as well, while being safer and better for the environment. You should not use acids or etchers to clean. You can use citric cleaners, Xylene, lacquer thinners, strippers, and cleaners that do not contain a heavy alkali. Sanding the surface if needed is acceptable, whether by hand or with larger machines from rental stores, such as commercial floor sanders and floor buffing machines with sanding pads. However, it will reduce the coverage of the stain and sealer. 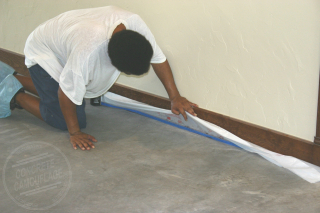 Once you have cleaned the floor, it is time to make any patch repairs that may be needed. We recommend that you do not patch small cracks or imperfections as they add character to the floor, but you decide for yourself. We do not recommend using a new cotton mop as it could leave fuzz on the floor. Although a cotton mop that has been used a few times does tend to have most of the fuzzies out of it. You may choose to instead use a synthetic mop. You can use Xylene or strippers for paints and a Mastic Remover, glue remover, or citrus stripper for sticky's. Use strippers for curing agents and waxes. You can use a power washer or water hose when doing a project outside. Just be careful of splashing. Pay attention to whether the water easily soaks into the concrete or not. (Especially important on new concrete.) If the water soaks right in, then the stain will too. However, if the water has a hard time penetrating the surface of the concrete then the finish is too tight and the pores must be opened for the stain to work well. You can do this by using a rented floor buffing machine with the black aggressive scrubber pads during final clean and rinse. If you have pulled up carpet, removing the tack strips along the edge may cause areas that need to be patched. If you score a border around the edge you can then stain the border a darker color, or do more coats on the border than the rest. This will help in camouflaging the patch work. Alternatively for small divots and holes, you can not patch them, then after you've stained and neutralized, you can use a clear epoxy to fill the divot and smooth out even with the surface of the concrete, allow to dry/cure and then seal. Scoring patterns and/or Multiple coats of stain strategically placed can help hide patches. ImportantTip. Ensure you have an entry/exit point with a means to clean off or remove your shoes, such as clean towels to step out onto. This is twofold, to keep stain from tracking where you don't want it, such as you're sidewalk or carpet. Secondly, to keep from tracking dirt back into the area. Alternatively, you can use disposable shoe covers each time you enter/exit the room. Tape and cover. Protect Your Surroundings. After you final clean the concrete, it is time to tape off and cover the bottom of all walls, doors, and anything else that might possibly get stain on it. Protect vegetation as well.